Now that the winter weather has hit London, we have some tips for keeping your home cosy and warm. We give you the lowdown on how inefficient windows can be a drain on your heating bills, answer some commonly asked questions, and recommend when it’s best to get replacement windows. Did you know that a typical home loses around 40% of its heat through the windows and doors? There are a few key ways you can insulate other parts of the home, such as loft or cavity wall insulation, but when it comes to the heat lost through the windows, things can get tricky. It’s difficult to modify your windows to make them more energy efficient. There are some tactics to reduce heat loss in this area, but many of these involve simply using plasters, which does solve the underlying problem. A good-quality, well-installed, double or triple-glazed window will hold much more heat in the house than an older double-glazed or even a new single-glazed window. There are several reasons for this, but it mainly comes down to heat conduction. Double glazing is more energy efficient due to the gap between the panes of glass being a poor conductor of heat — a heavy inert gas is usually used here. This means it takes longer for the cold air from the outside to bring down the temperature inside. But why might this not be working as well as it should? 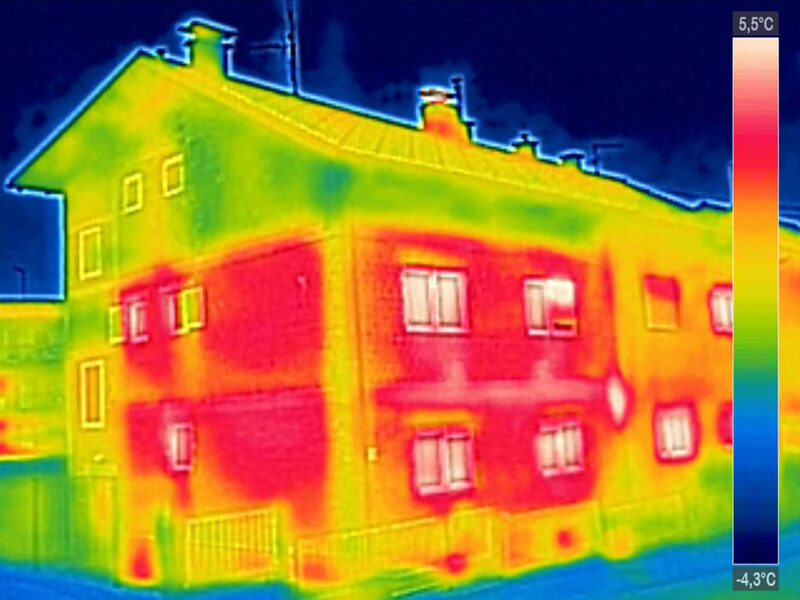 This thermal image shows just how much heat is lost through the windows compared to the solid walls and roof. I Can Feel a Draught: Does My Window Need Replacing? It’s really important to check for draughts around closed windows. A well-fitted window will be airtight around the frame, and between the frame and window pane. If you feel a draught, something has gone wrong — either over time or during the installation process itself. The first possibility is that over time the seals between either the wall and the frame or the glass and the frame have degraded to the extent that they are no longer airtight. Less likely, but still a possibility, is that whoever installed your windows didn’t do a great job of sealing the window unit, causing a leakage of air. If you have a leaky seal, this can be repaired. And it should be repaired as until you do, you may as well have single glazing. The gas in between double-glazed panes is put there as it conducts heat less than the air outside. If a seal has blown, it’ll be filled with air that can circulate. If your window fogs up on the inside, this is a tell-tale sign that a seal has broken. It is not recommended that you try to fix a broken window seal yourself. If you know who installed your window, you should try to contact them to get it repaired. Many glazing companies will not attempt to repair the work done by a different contractor. The only true fix is to replace the unit itself. Are There Any Simpler Solutions? You can do a number of things to keep the heat in your home without doing any repair work. These should be viewed as temporary solutions, however. Shutters, blinds and heavy curtains can all add to the energy efficiency of your home. Modern curtains are often not a great solution, as they are typically manufactured using lightweight fibres with little insulation value. Therefore, they have little impact in terms of preventing heat loss. Traditional brocade curtains, however, often contain natural fibres that can cut heat loss by 14 per cent. Blinds and shutters have a similar impact if you choose a heavy material and fit them close to the walls to account for draughts. These solutions are effective, as they add an additional barrier against heat loss. In the same way as it would be good for a home’s energy efficiency to brick up the windows, having heavy curtains that are shut tight will prevent some heat from escaping. But of course, this is not a long-term solution. It is not practical to have to keep your blinds, shutters or curtains closed throughout the winter months. It is, however, very useful as a stop-gap before you can get replacement windows or the problem units re-sealed. What Is the Expected Lifespan of a Window? The answer to this question varies greatly, as it is heavily dependent on how well the window is kept. Physical damage either to the pane, seals or frame will clearly have an impact, but even without obvious bad practice, a window will degrade over time. All windows have an expected lifespan, and how long you can expect a window to do its job effectively will also depend on the build quality of the unit itself, as well as how well it has been installed. Standard double-glazed uPVC windows installed 20 years ago will, of course, not be as efficient as they were when they were first installed, and a window installed in 2018 is going to last longer than its relative counterpart installed in 1998. It’s also a galling fact that many glazing companies can look to save money by cutting corners, not only in the sourcing of their materials, but in how they install windows as well. It’s common to find cheap and inefficient windows installed to a very low standard — the cheaper a window unit, the poorer the work usually carried out. The best replacement windows will not begin to show signs of deterioration for around 30 years, but most experts believe 20 years is a good benchmark for well-kept glazing units installed to a high standard. How Do I Know If I Need to Replace My Windows? If any of the above factors sound familiar, it is worth considering the possibility that your home needs a revamp in terms of its windows. There may be just one problem window that fogs up, or you might feel that your home, in general, is in need of more extensive work. It’s your choice, but if you know that your windows are at around the end of their expected lifespan and you are increasingly feeling the cold year on year, it’s probably best to bite the bullet and start thinking about replacement windows. All things considered, making large-scale material changes to something as important as the windows in your home can seem like a stressful endeavour, especially prior to doing your research. This expected upheaval puts off many homeowners, even if they find themselves living in extremely energy-inefficient homes. However, upgrading such a fundamental aspect of your home is a slow burn in terms of reward, and the process is far more straightforward than most expect. We offer a simple service where you can send us photos of your property, or just the particular windows (or doors) that you’re considering replacing, and we will send a quote within a couple of days. This means you don’t need to take time off work to wait for a windows specialist to visit your home to get a rough idea of how much it will cost for you to get the windows replaced in your London home. Find out just how easy it is to get a quote for replacement windows for an upgrade to your home that will pay off for years to come. Timber or uPVC Windows — Which Are Best? Is Winter the Best Time to Fit Replacement Windows in London?